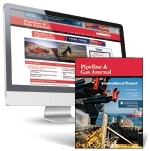 Gas Processing & LNG is the first publication solely devoted to the gas processing industry, with distribution among upstream, midstream, and downstream executives and engineers. Gas Processing & LNG covers: Natural gas liquids (NGL), Liquefied natural gas (LNG), Gas-to-liquids (GTL), and Liquefied petroleum gas. Since 1922, Hydrocarbon Processing has been a leader in providing cutting-edge technical content and information to the global refining, petrochemical, gas processing and LNG industries.